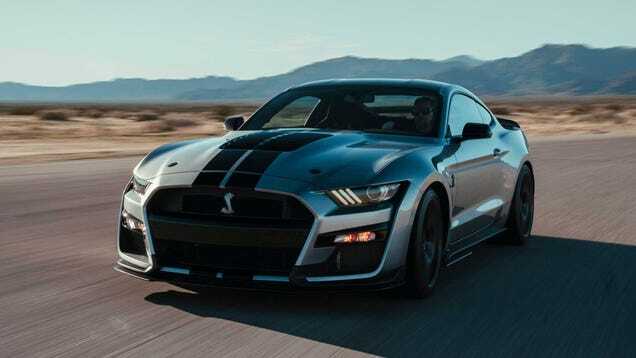 The new big-dog 2020 Ford Mustang Shelby GT500 is finally here with at least 700 horsepower from a supercharged cross-plane V8, and it backs it up with an all-new dual-clutch gearbox. It’s the most powerful street-legal Ford ever. Will this be the American performance car to beat? Good luck buying one for a while. The mark up will be ridiculous but on the bright side they won't be able to give away GT350s which are already starting to sit on lots around my area. No, this won't be the American performance car to beat. Wouldn't that be either GT or ZR1? It's just going to be a really expensive pretty good Mustang that will still lose in road test comparisons because this chassis just doesn't handle as well as the Camaro's chassis. As good as the PP1 and PP2 packs are on the GT, it still loses out in road test comparisons. Having said that I would still buy one in a heartbeat because it is a Mustang and sounds awesome. the stealerships will keep me away for a few years however. I'm really curious how well it'll put the power to the ground. The biggest problem i have is getting my car to hook up.